TTIP: Transatlantic Trade and Investment Partnership would create the biggest free trade area ever. The biggest trade deal of all time is being negotiated and nobody’s paying attention. 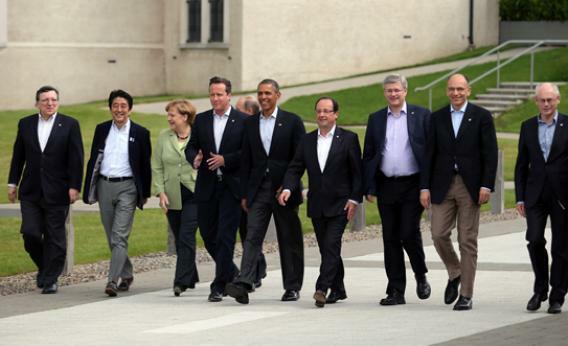 From left: President of the European Commission Jose Manuel Barroso, Japanese Prime Minister Shinzo Abe, German Chancellor Angela Merkel, Russia’s President Vladimir Putin (walking behind), Britain’s Prime Minister David Cameron, U.S. President Barack Obama, French President Francois Hollande, Canadian Prime Minister Stephen Harper, Italian Prime Minister Enrico Letta, and European Council President Herman Van Rumpuy, arrive for the group photograph at the G8 venue of Lough Erne on June 18, 2013, in Enniskillen, Northern Ireland. You may not be interested in the Transatlantic Trade and Investment Partnership (TTIP), but TTIP is interested in you. And you may not recall the moment in Barack Obama’s State of the Union address when he called for a free trade pact with the European Union, but policymakers on both sides of the Atlantic have continued to grind forward with the process. Last Friday, the European Union’s trade ministers delivered an official mandate to the European Commission to begin negotiating an agreement. No matter how dull it sounds, if it happens, it’s going to be a really big deal. TTIP would be the biggest trade pact of all time, by far. It creates a trading bloc far larger than NAFTA—extending from California to Romania, and encompassing almost half the world’s total economic output. It would reach much deeper “behind the border” into public policy areas people don’t think of as pertaining to trade. The $2.8 trillion of GDP generated by our NAFTA partners Mexico and Canada is swamped by the European Union’s $16 trillion economy. TTIP would rework virtually every federal regulatory scheme, providing opportunities for huge new economic efficiencies but also for dramatic levels of malfeasance if, for example, banks use it as a pretext to undermine post-crisis financial regulations. Recent free trade deals between the United States and Latin American countries have included much more than conventional formal barriers to international transportation of goods. But TTIP takes that trend much further, aspiring to harmonize regulations on both sides of the Atlantic. That’s a very ambitious goal. The optimist’s case, as explained to me last week by numerous European Union officials and politicians, is that there’s too much duplication of regulatory effort on both sides of the Atlantic. Right now an American tourist can get in a taxi in, say, Berlin and feel reasonably certain that he’s in a safe car. The same applies to a Berliner visiting New York. Broadly speaking, the U.S. and the EU are both wealthy liberal democracies whose citizens care about product safety. But even though many of the same car companies operate on both sides of the Atlantic, they’re actually operating under very different car safety regulatory schemes. These divergent regulations aren’t a “barrier to trade” in the traditional sense, but they do impede international commerce. For big firms, this is about the cost of complying with multiple sets of regulations. For smaller firms, the issue is that figuring out a new set of rules is more trouble than it’s worth. The United States is so large that a single set of rules can apply across a very large market. The European Union is a more recent innovation, but its core economic achievement has been the creation of a U.S.–style, continent-wide, integrated marketplace. TTIP could bridge the two, creating a single set of standards for a marketplace covering half the world’s GDP. Related advantages could be seen in food and drug safety. Right now, both the FDA and its European counterpart insist on inspecting pharmaceutical manufacturing facilities. That’s sensible, but does any given plant really need to be inspected by both agencies, or could they work out terms for a mutual recognition agreement in which a thumbs-up from the FDA would be good enough to sell a product in Europe? According to proponents of TTIP, the gains of broad regulatory harmonization could be very large, amounting to an economic boost of more than $100 billion a year in the United States and somewhat more than that in Europe. But tackling these kinds of non-tariff barriers to trade is easier said than done. Deals with big positive impacts for some interests always have downsides for others. The EU, for example, is eager to change rules that prevent European airlines from flying on U.S. routes. Injecting that kind of competition would reduce the recent trend toward higher airfares. But it could also push one or more American airlines back into the cycle of bankruptcy and job losses. The traditional case for freer trade—that the gains outweigh the losses—applies well to TTIP. But there’s also potential for enormous mischief. Business talks a big game about its desire for simpler and more harmonious rules, but in practice this means they want laxer regulations. Mutual recognition could become a platform for a regulatory race to the bottom. America could adopt European-style lax rules about bank capital while Europe is pushed to embrace American-style light regulation of hedge funds. These concerns don’t mean that a trans-Atlantic free-trade zone is a bad idea. In principle, it really is a great idea. But negotiators in trade agreements have a tendency to become lobbyists for their respective countries’ entrenched business interests rather than stewards of their citizens’ interests. And that’s especially likely to happen when normal people tune out. As talks begin this summer, people ought to pay attention and make it clear to their legislators that open markets are good, but a trade deal shouldn’t be a vehicle for sweetheart deals.